Our lab uses the budding yeast, S. cerevisiae, as an experimental organism to study DSBs, because it possesses many characteristics of more complex organisms, yet offers many advantages of studying a simpler, unicellular organism. These include its small genome size and its utility in laboratory and genetic procedures. Interest in yeast as a laboratory organism grew in the 1980's due to the ability to introduce DNA into yeast cells by transformation and thereby alter its genetic content. Prior to this, though, there was a substantial interest in yeast from both the genetic and biochemical viewpoints, which provided a large body of information about yeast. To study DSBs, we induce expression of an endonuclease within the yeast cell that creates a single DSB within the entire genome and then we employ a variety of techniques to follow what happens. We are interested in the mechanisms of DNA repair, either by homologous DNA recombination or by DNA end-joining. We are also interested in processes that DSBs initiate, such as cell cycle arrest and the process of mating type switching. 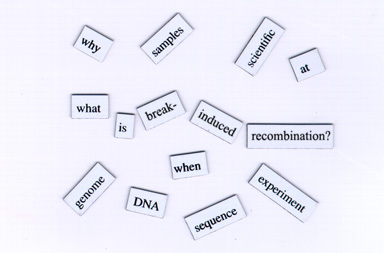 At this website we have provided a brief introduction to the study of break-induced DNA recombination as well as more detailed descriptions of our research interests. For scientists, we have also included a selection of detailed lab protocols, some of our recent publications and a few links to other relevant laboratories.